Yes, I’m sure you must have at least an email address, and I’m sure you must receiving unsolicited email advertisements, phishing emails, and spam emails too. Never ? That sound impossible. Today, I’m not sharing the information how to deal with the above issue, because that’s not possible to do anything, all we just can rely on your email provider, such as GMail, Yahoo! Mail, Hotmail etc, their spam killing techniques to help you to kill most of the spam, phishing and scam. I’ll focus on any bloggers, anyone who are actives in forums, discussion boards, and DIY (do it yourself) web site builders. For those who involved in above activities, especially you owned a blog or website, you will include your email address to let your readers or advertisers to get in touch with you. This entry was posted in Safe Info and tagged email, phishing, robot, Scam, spammer on June 6, 2012 by RMvalues. 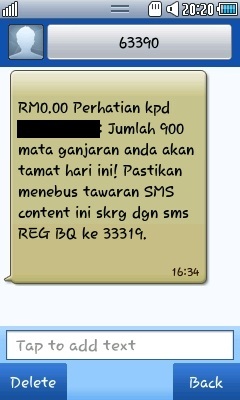 One more scammer sms received from sms broadcaster 63390, according to the content and instruction, this scam sms is belong to the number 33319, which is owned by Everworks Solutions (M) Sdn Bhd (www.everworks.com.my). This entry was posted in Safe Info and tagged 33319, 63390, alert, Scam, sms on April 6, 2012 by RMvalues.